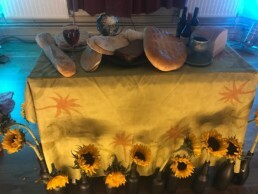 Clapton Park United Reformed Church meets at 10.45am each Sunday morning gathering for music and singing before the service begins at 11am. The singing includes contemporary and traditional music led by an informal group of acoustic musicians. Clapton Park United Reformed Church has a lively multi-ethnic congregation from a variety of traditional and new church backgrounds with many young families. We meet in the former school rooms on the side of the historic Victorian Round Chapel. Countries represented in the congregation include Ghana, Nigeria, Angola, U.S., England, and Australia. The majority of the congregation are either adults of a working age, children or young people. People’s jobs include teaching, nursery workers, video-making, school assistants, Quaker Peace and Justice, journalism, community development, social work and much else. The church is a United Reformed Church congregation (see www.urc.org.uk for more information). It began in the mid-19th century at a time of Congregationalist revival.